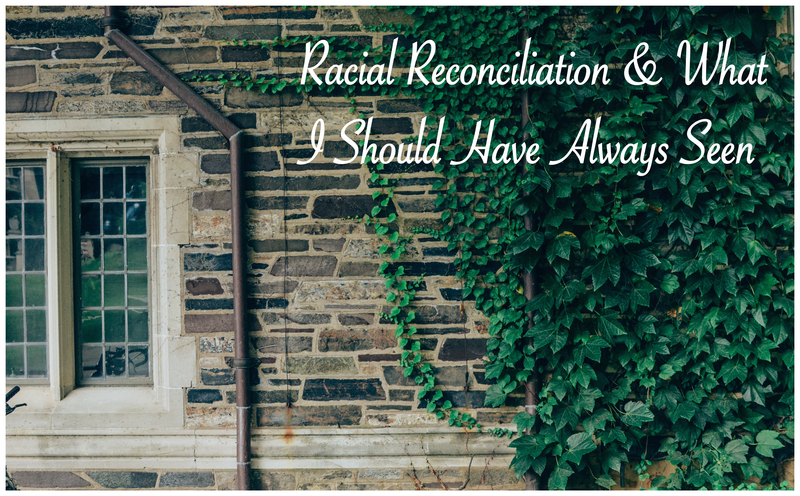 Racial Reconciliation and What I Should Have Always Seen - It's a Story. The room had the mismatched coziness any good college apartment should have. The walls were bare except for three stunning paintings hung above the couch. On one canvas was a painting of Christ’s crucified hands, another a painting of his feet, and the third a painting of his face. The women lounging around on blow up mattresses and couches were already rolling with laughter by the time I walked in. These were women who loved the Lord with a sweetness and a depth that couldn’t help but leave an impact on you. They radiated a kind of joy I had never seen before. I was terribly lonely that first semester, but those women welcomed me in with open arms. An invitation to spend an entire sleepover laughing and talking with them was a dream come true. So that was how I found myself in that tiny apartment–a blonde haired and blue eyed girl–sitting alongside women of all different backgrounds, but all with skin much darker than mine. “Do you remember the time…” one girl began. Her voice faded into the mixed sounds of laughter, someone offering up dessert, and another girl yelling from the back room that her online exam was almost finished. The girls around me burst into laughter. I grinned and attempted a chuckle. But they all quickly took notice of my confusion and smiled. One of the girls patiently explained the affect of rain on newly done black hair to my ignorant, blonde-haired self. I laughed at myself as they laughed with me, and we all moved on from my clueless moment. The sleepover conversation carried on from deep discussions of theology to attractive actors to what was happening on campus. The shooting was all anyone had talked about since the riots had started, but I’d never heard it discussed with such emotion before. My aunts and uncles, grandmothers and grandfathers–all of them discussed it over brunch and sweet tea. But I realized as I listened to the women around me that this was personal. It had never been personal to me before. I curled up on a couch, tucked away on the fringes of the discussion. That night I listened to a conversation that changed everything I’ve ever thought. They began to tell their stories. A cruel comment here, an obvious insult there, and time after time in which they had been pushed down and out of sight. Just a few stories in and I wanted to melt into the ground. As I listened, even their most minor stories captured my full attention. My blind eyes were being opened to what racism looks like in the 21st century. This racism doesn’t look exactly like it did 40 years ago, but it is cruel and horrifically unjust all the same. Racism looks like this and a thousand other things. Things that had slipped right past me in my privileged little world. When the conversation finally died down, I was in a daze. “Hey Jaime, what do you think of all this? I’ve actually never talked to a white person about this stuff,” one of the girls asked as they all turned to me. I had no words. Or maybe words did come out of my mouth, but they sounded more like an awkward apology than anything else. In that moment, I made a mistake. I made the mistake of believing I had no right to speak. If I had known then how rare it was to be in such a safe space for that conversation, maybe I would’ve been bolder. Maybe I would have asked questions. Maybe I would have asked how I could change. I should have known that not only did I have the right to speak, but I had the responsibility to ask questions and try to understand. I don’t claim to understand the issue in all of it’s complexity. One conversation would never be enough to make me understand what others live every day of their lives. I regret my silence, but just by listening, my eyes were opened. Once someone pointed it out, the injustice was impossible to ignore. To those who are in the majority, please, in the midst of all the back and forth, in all the building of walls, in all of the controversy and heartache and cruelty–please stop and listen. Don’t jump to your own defense the next time you hear the words, “White Privilege.” You are not under attack. To those who are in the minority, please, in the midst of all the same strife–please talk to us. Have patience with us. There are many, many people who are ignorant for the same reason I was. They have never heard your story. They have never known the person. They’ve only known the issue. My hope is that you and I will stand up in whatever way we can to heal this brokenness. I will be forever thankful for those women who welcomed me in and opened my eyes to a world right outside my door. A world that, perhaps, I would never have seen on my own.